It is not often that billion dollar corporations are developing products meant to help the disabled. But Huawei did just that. The Chinese phone manufacturer developed an app called StorySign to help deaf children. StorySign launches today in the UK. The app is engineered to make bedtime stories more fun for deaf or hard of hearing children. The app also helps children learn how to read. Artificial Intelligence is working behind the scenes to make StorySign function. StorySign’s main component is driven by AI which helps translate each word into proper sign language. An animated character called Star is there to help deliver the sign language on to users’ screens. Huawei says the app can recognize words even when the display is at an angle. StorySign also has the ability to control the speed at which pages are loaded in the app. This helps the sign interpreter engine to catch up with the sentences. This will presumably help prevent lag and provide real-time translations. Hence users won’t have to worry about the translations going out of sync. The app initially launched with the popular children’s book “Where’s Spot?”. Huawei plans to add support for more titles soon. StorySign will not only assist deaf and hard of hearing children enjoy storybooks but will also help them learn to read. There was a definite need for such an app, as many kids face such debilitating problems. StorySign would also put an end to many of the struggles associated with reading. StorySign is available to download from Google Play Store and Huawei App Gallery in ten regions spread in Western Europe. Huawei worked with many smart agencies and Non-Profit Organization to create such a useful and humbling service. This application will not only assists deaf children but also helps parents as well. As 90% of deaf children are born to hearing parents, some of whom do not know sign language, StorySign is greatly beneficial. By simply reading children’s books, parents will slowly be learning sign language simultaneously as their children are read storybooks. 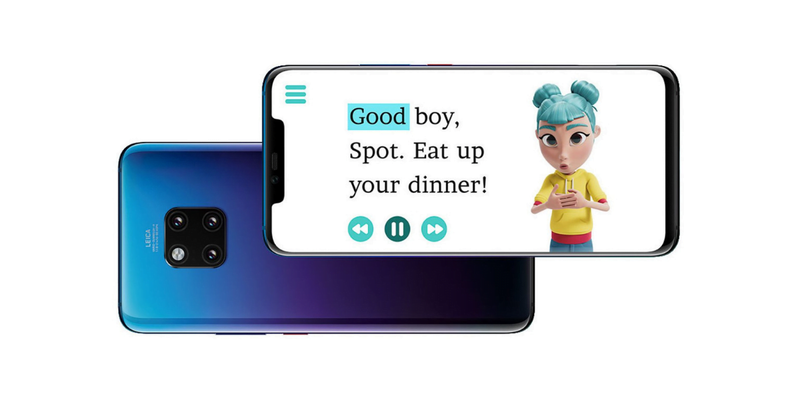 Huawei worked in partnership with experts and charities including the European Union of the Deaf and The British Deaf Association, to create StorySign. The StorySign animated character was created by Aardman Animations. Huawei is making the app available in 10 sign languages (British, French, German, Italian, Spanish, Dutch, Portuguese, Irish, Belgian Flemish, Swiss-German). It will have one storybook for each language. Star is a blue haired character wearing a yellow hoodie and yellow sneakers with blue jeans. Star seems like a totally friendly and catching avatar. The vibrant colors help grab the attention of the children. Hopefully, more tech companies will follow Huawei and help develop apps that are not some money making machine, rather a way to give back to the community.